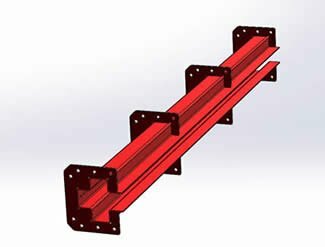 PAC-MAX™ Conveyor System replaces the typical spindle / chain-on-edge conveyor. When this Tier 1 automotive parts supplier was building a new facility to handle paint and finishing of plastic parts, they were looking to improve on the material handling process they had used in the past. The external bearings were exposed, making them susceptible to dust, paint and other debris. The heavy cart and exposed bearing on the side tracks can create increased friction, especially around curves. This friction and the increased power required to move the carts can make it especially difficult to operate if there is an incline in the track. Around tight curves there is an increased possibility of the trolley cart jamming in the guide track. 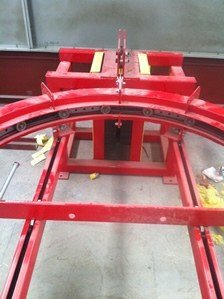 When building their new paint finishing operation, this customer came to PACLINE looking for a conveyor that would eliminate the need for external support rails and one that had the chain and bearings protected from paint and debris. The system required would be approximately 1000 feet in length with an incline section to transport the plastic automotive parts from the loading area at floor level into the robotic spray booth and ovens. Custom carriers that could be manually or automatically rotated would be designed to hold the plastic parts and transport them from the wet spray operation through to the drying and curing oven. The conveyor needed to withstand the oven temperatures of up to 200 degrees Celsius. The PAC-MAX™ enclosed track conveyor was selected for this installation. 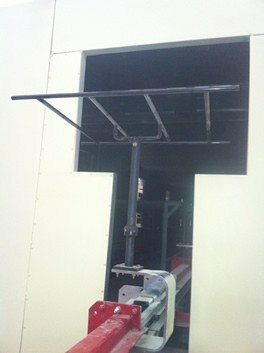 This heavy duty conveyor has a unique cross shaped enclosed track that can operate slot up, down or sideways with a high degree of stability, even when handling tall carriers or parts. For this job, the PAC-MAX™ was installed in the slot sideways orientation. Along with providing excellent stability, this also ensured that the chain bearings had protection from paint over-spray and debris. The final conveyor system was 930 feet in length with a total of 40 curves and required elevation changes from the floor level load area to the spray booth and oven. Even at this length, the entire PAC-MAX™ system was powered by only one ¾ horse power motor. Initially, the customer was concerned that this would not be sufficient to drive the system which included 5000 lbs of chain and carrier attachments plus 6000 lbs for the rotating top fixtures and plastic parts. However, the PAC-MAX™ chain is designed for very low friction resulting in uniform chain pull throughout the system and reduced power requirements. In addition, the take-up unit for this system was a gravity powered counterbalance design. This take-up provided uniform tension with NO power requirements and the capabilities to add or reduce weight to suit the application. 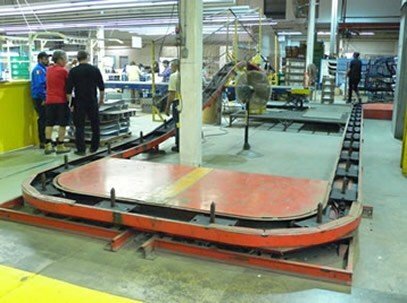 Finally, another unique feature of the PAC-MAX™ conveyor system is the rolled curved corners of the track. Unlike the typical spindle conveyor or chain-on-edge conveyor systems, there are no traction wheels in the PAC-MAX™ which helps eliminate surging, especially in paint ovens. The roller turns or traction wheels in the typical spindle conveyor system are more costly and definitely require more maintenance than the PAC-MAX™ curves. The PAC-MAX™ system exceeded the customer’s expectations for this Tier 1 auto parts finishing operation – a consistently smooth running, stable system that handled curves and elevation changes with extremely efficient power requirements. The PAC-MAX™ has been proven time and again to deliver a high degree of stability even when carrying heavy parts above the track for clean paint lines such as this auto parts finishing operation. For more information regarding the PAC-MAX™ for finishing operations, please visit here.